It's morning! Wakey-wakey, my friend! It’s about time that you prepare some breakfast for the whole family. You do not have enough time to cook all those bacon and eggs and pancakes without your kids and partner being late! With the help of a useful electric griddle, that is! Typically, griddles are identified with a large cooking area. This cooking equipment usually doesn’t have raised edges and are perfect for cooking food which needs a flat surface to cook. Modern-day griddles resemble a slab and feature material like aluminum and steel. And although griddles can be heated on fire, the most modern models of today require electricity to function. Not like any conventional griddles, the electric versions significantly heat up faster and provide more space for cooking different foods at once. Griddles reduce the amount of time that you spend on cooking and cleaning. A large griddle can accommodate more food for cooking; therefore it reduces the pans and pots that you will need to clean. Most electric griddles are non-stick. Therefore, you need less oil in order to cook your meals. Also, most electric griddles come with grease wells or drip trays which allow you to collect excess oil during the cooking process. Cooking with an electric griddle allows heat to be evenly distributed. This ensures that the food you are cooking is evenly cooked; therefore there will be no half-cooked or burned foods. Electric griddles have a large cooking surface area that allows you to prepare or cook a large amount of food item at the same time. Electric griddles need electricity in order to operate rather than gas. Therefore, the operation cost is usually lower than using natural gas. Searching for the best electric griddle in the market today can be time-consuming, especially if you don’t know what sort of features you need to look out for in an electric griddle. In order to make it easier for you to identify the best electric griddle out there, here are some of the key features that you need to look out for. Composite: The most common variety of electric griddle material features a core which is made of aluminum, a very light material that provides a good heat transfer. Aluminum, however, is not that durable. Steel: Steel is the most common plate material for electric griddles. It is excellent in conducting heat, easy to clean and quite durable. Steel, however, needs a lot of maintenance and if it is not applied with oil frequently, it has the tendency to rust. The solution for such problem can be found in stainless steel griddle tops. Cast Iron: Electric griddles made of cast irons feature and even better heat conduction and is much cheaper than steel. However, cast iron is also known to be heavier and more susceptible to rusting like iron. Chrome: Chrome materials are very easy to clean. Also, because of its smooth surface, chrome is much more suited for flipping foods such as eggs and pancakes. However, chrome surfaces tend to be damaged when cleaning with sharp materials or abrasives. Ceramic: Ceramic makes an excellent plate material since it is durable and provides easier cleaning. Ceramic coating, however, is prone to wearing off and can easily chip off when not properly maintained. The single surface type features a flat cooking surface that is heated by an electrical heating element that provides a continuous supply of heat. The heat is evenly distributed throughout the cooking surface in order to ensure that the food will have an even cooking. Single surface electric griddles are typically constructed of aluminum and/or stainless steel. They come in a broad range of sizes and offer a variety of features that enhance your cooking experience. This electric griddle also features a flat cooking surface but also has a slanted surface which can be used for grilling. Such surface can be attached through a different plate or the single surface plate might have a slanted surface on the other side, whereas the plate can be simply turned over in order to turn the electric griddle into a grill. Just like the single surface electric griddles, this type also boasts broad features which can help improve your cooking experience and comes in different sizes. The cooking or grilling surface does not only determine how easy it is to cook your food but it also dictates how fast and easy you can clean your electric griddle. 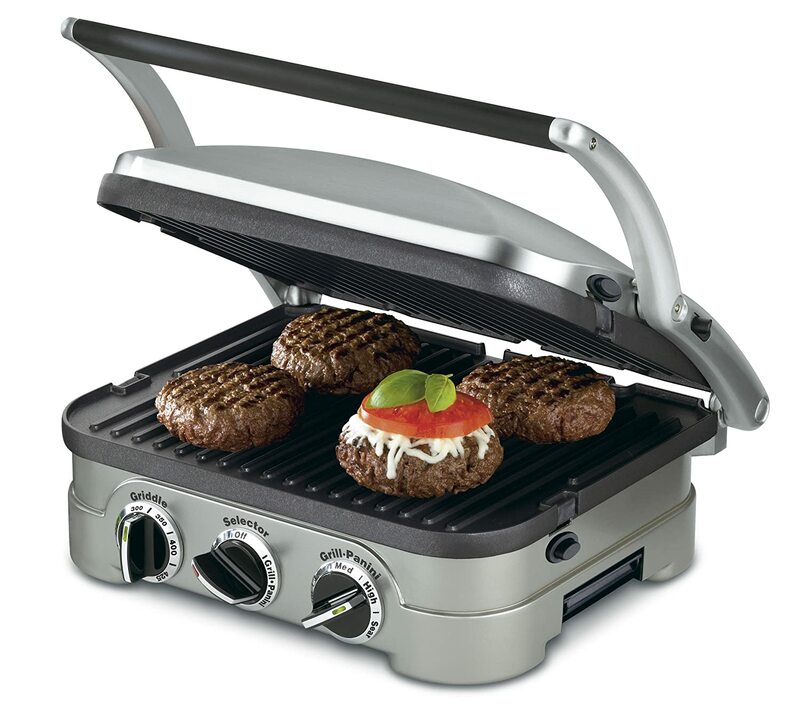 The grilling surface of an electric griddle can be flat or with grids. Electric griddles with grids on their grilling surface might be hard to clean than those with a flat surface. Whatever you choose, you need to make sure that the grilling surface should be non-stick. The size of the cooking or grilling surface defines how much food can you prepare in one go. If you wish to cook more food or looking for a commercial electric griddle, then you need to have an electric griddle with a large grilling surface. Then again, if you intend to use the griddle to only cook for your family or a few people, then you should get one with a small grilling surface. Most electric griddle features a single griddle plate while there are some that come with additional grill plates. If you intend to prepare various foods with the griddle or you just love cooking different foods at the same time, then you might want to choose for an electric griddle that offers extra griddle plates. The heat controls of the electric griddle allow you to control the temperatures that you wish to use in cooking your meals. Electric griddles have different heat controls. Some models have to keep warm functions which allow you to warm up your meals or keep cooked meals warm while waiting for other food items to be cooked, dual thermostats as well as the capability to allow you to cook various meals with different temperatures. If you hate a messy counter, then you should get an electric griddle which is equipped with useful drip tray. Depending on the food that you are cooking, you might have plenty of grease building up on the cooking surface of your electric griddle. Once the cooking surface of your electric griddle is full, the grease will either continue to pile up on your cooking surface or fall on your countertop. Having a drip tray on the electric griddle can prevent any of these from happening. With indicator lights on electric griddles, you will know when the cooking surface has reached the right temperature that you selected. This slows you to avoid undercooking your food. Most people forgot to take this factor into consideration. Dragging the extension cord around the kitchen in order to find the place where you can prepare breakfast is not something that you should have a hard time of. Check the length of cords that should suit the layout of your kitchen before you make a purchase. Try to look for an electric griddle that is easy and fast to clean and maintain. A good electric griddle comes with removable parts which are dishwasher safe. There are even some electric griddles that can be fully submerged in water for a hassle-free cleaning. As always, when shopping for the best electric griddle. You need to determine the budget you are willing to spend. The prices for electric griddles vary depending on the various features they offer, the size of the griddle and of course, the brand. You should get a griddle that matches your budget and the simple features that you need. The Presto Electric Griddle has a 22 inch of cooking surface which allows you to cook at least 2 or 3 rounds of breakfast with ease. Made from heavy-duty aluminum, this electric griddle will not only last for many years to come, but its design also offers great heat conduction. It even has a non-stick coating so that you would not need any cooking oils at all. This electric griddle from Presto also comes with removable handles which allow you to place it inside an 18-inch cupboard. It also features a handy slide-out drip tray which can capture grease from the cooking surface effectively. Lastly, the Presto 22-inch electric griddle is quite easy to maintain and clean since the whole product can be fully submerged in water. 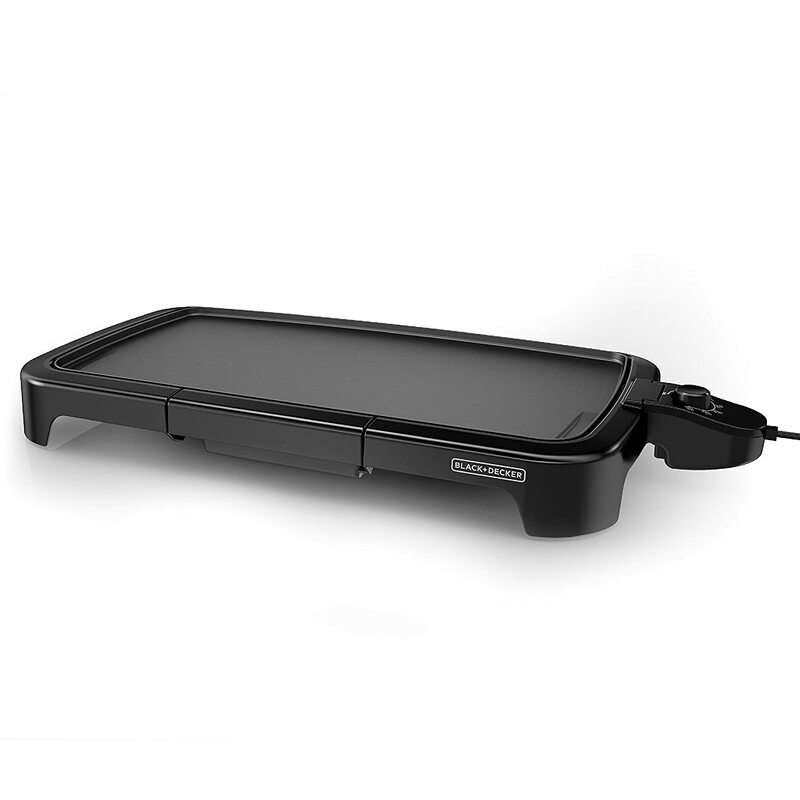 At first glance, this electric griddle from BLACK + DECKER is quite similar to Presto’s electric griddle. This electric griddle is also spacious with a total surface of 210 square inches which allows you to cook 8 pancakes and 12 strips of bacon. This electric griddle features easy dismantling and its cooking plate is quite easy to clean. It has thermostat heat control and is dishwasher safe. It also has a non-stick coating so it requires no oils when cooking and it has a drip tray for capturing grease. The Cuisinart electric griddle might be the oddest one on this list, however, its unusual properties give this unit a lot of value. For starters, this electric griddle is a press which is a good thing— although it might be bulkier than other electric griddles out there. If used as press, the griddle has a cooking surface amount of 100 square inches and goes up to 425 degrees Fahrenheit which can handle even raw meat. When unfolded, however, this electric griddle from Cuisinart offers a comfortable 200 square inches of cooking surface. The build quality of this unit is also excellent and it is made of sturdy stainless steel material that should last for ages. It also features replaceable plates for easy cleaning. Are you looking for an electric griddle which can provide you the same result as your outdoor grill? Then look no more! 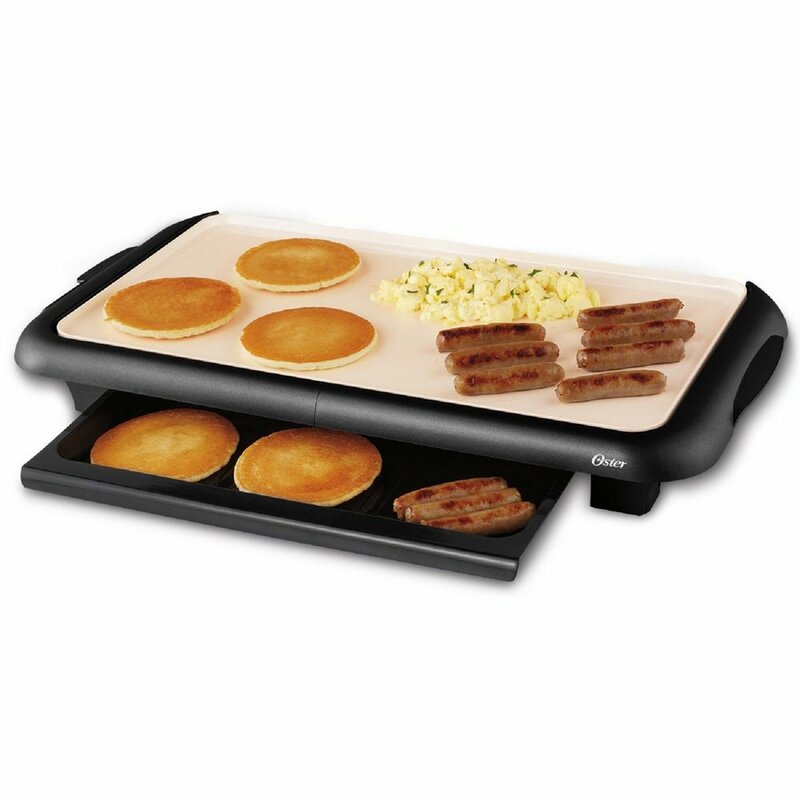 The Hamilton Beach Electric Griddle is exactly what you are looking for! 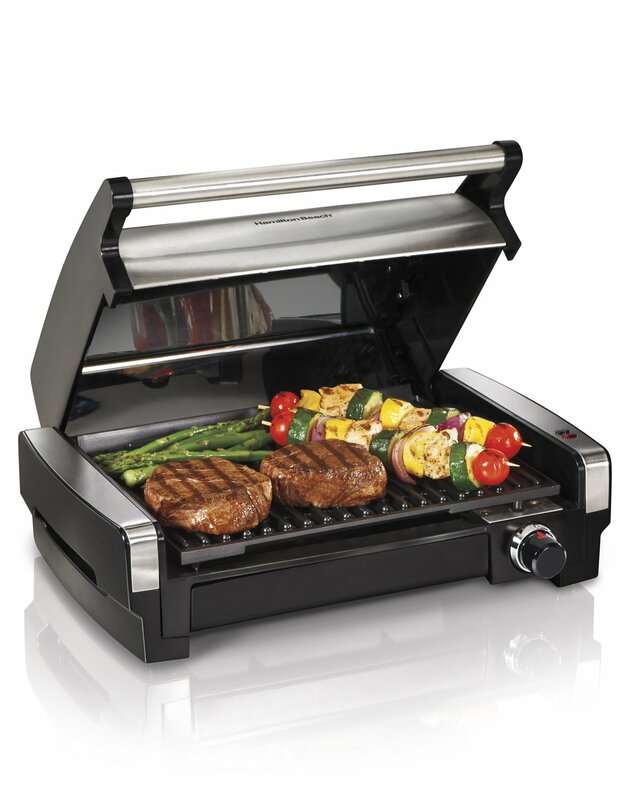 Featuring a non-stick cooking grid, this electric griddle creates those perfect sear marks in your steaks, chops, and burgers. Its cooking plates are also removable as well as the drip tray and hood, making the cleaning process quick and easy. This electric griddle also features an adjustable dial controlled temperature that allows you to get the right cooking temperature. With a high searing temperature, the flavors and juices of your food ill are locked in for a tasty, juicy and flavorful meal you will surely enjoy. The indicator lights of this electric griddle let you know when the temperature of your choice has been reached as well as letting you know that the device is on. Finally, this electric griddle has a stainless steel housing which offers a sleek look that adds a touch of elegance to your countertop. Ceramic is one of the most recent non-stick materials. And this electric griddle features the proprietary DuraCeramic surface that is made from natural materials that will not peel or flake like the old-style Teflon. It is quite easy to clean and is less likely to scratch when using a spatula to cook your food. 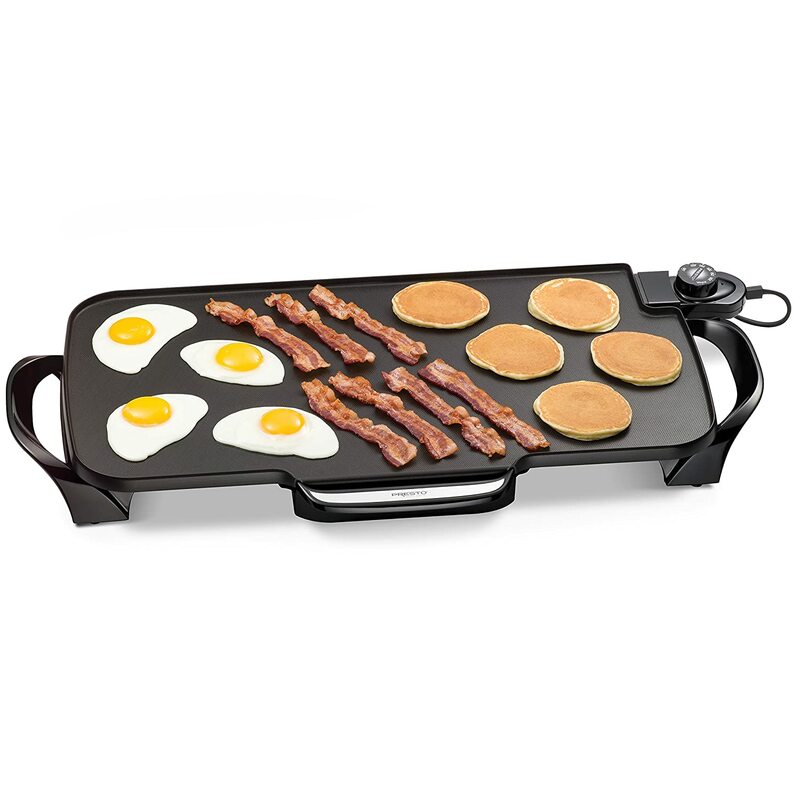 The Oster Electric Griddle has a cooking surface of 10x18 inches which provides you plenty of room for cooking breakfast for the entire family. And in case you got more guests coming for breakfast, it comes with a warming tray where you can start the cooked foods in order to keep them warm while making more servings on the cooking service above. This electric griddle has handles designed to stay cool during cooking so you will not hurt your hands. Furthermore, a grease channel is added in the cooking surface brings liquids and fats and oil into the drip tray for easier cleaning and less mess on your kitchen countertop. Its temperature control is removable for easier cleaning and goes from warm temp to 420 degrees. As the KING OF ELECTRIC GRIDDLES 2018! With a really large cooking surface, you can cook meals for the entire family in one go. It offers healthy cooking since it is free from harmful chemicals and has a durable surface which does not chip or flake easily when properly maintained. Furthermore, its grease channel and drip tray give you a mess-free cooking as well as making cleaning a breeze. Oster also kept your safety in mind with handles designed to stay cool during cooking in order to prevent accidents from burning your hand. Some people think that electric griddles are not necessary for the kitchen since there are the might pan and stove. Sure, you can make pancakes, fry bacon and eggs on a pan and on the stove, however, an electric griddle offers you more! From multiple food cooking to temperature control, electric griddles will make sure that you will not regret buying them. Did you find this article helpful? I do hope so! If you have any questions or suggestions or maybe using an electric griddle that is competent enough to be on this list then feel free to sound your mind on the comment section below. I’d love to hear it! NextNext post:Dessert Talks: Is Pudding Gluten-Free?